I installed the system later in 2013, it took me longer than expected for two reasons, first because we had our first baby early that year, and second because when I started the project I started to get rid of different layers of electrical systems that former owners had installed. Indeed, that was an unexpected advantage, knowing that the old engine was going out it was easier to isolate the few electrical systems that had to remain and get rid of the rest. I had to glass the fiberglass supports for the motor. I also needed some fiberglass work in the battery compartment, to avoid movement of the batteries. The main reason why you will be going over budget is because you may be opening lots of new projects while you are on it. 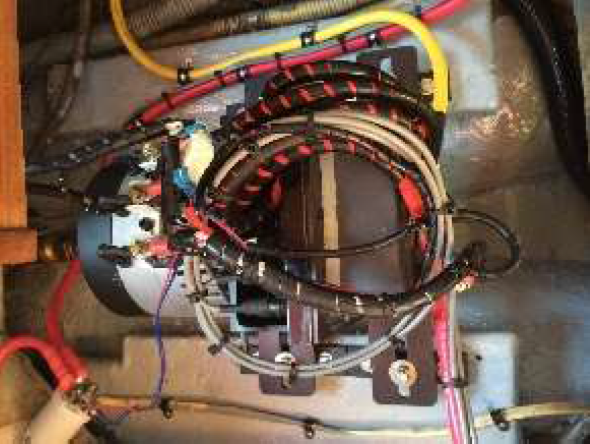 When it comes to the new system, I bought a complete kit from Electric Yacht, QuietTorque™ E-Drive 10.0 Motor, QuickCharge 48V x 25A Onboard and batteries Sea Volt 12Y,200Ah, Size 8D, AGM (Initially I wanted to install the 250Ah batteries, but they would have not fit in the old diesel tank area). I don’t know how they are doing today, but for the charger and batteries they gave me a better price than what I was finding in my own, so it was not worth the hassle of shopping around the miscellaneous. I had to buy all the wiring for motor, batteries, etc., but we are talking about short runs. I also bought a Yamaha 2000 generator, just in case I ran out of batteries, but I haven’t used so far. Well, having a baby is kind of challenging and the longest we have been motoring in the water is around 3-4 h, and that doesn’t drain the batteries. I was able to fit all the batteries in the gas tank compartment (see attached picture), with them leaning the weight slightly to starboard. Some fiber glass work helped to ensure they will not be moving around. 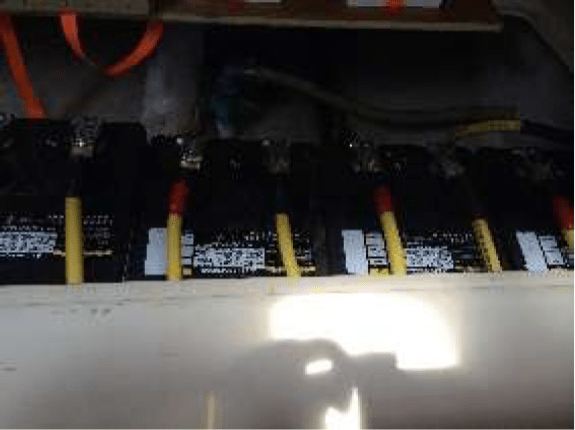 It may not be perfect (and I am not unquestionably recommending it), but considering the overall weight of the boat, I was not that concerned about how this affect to the overall list and trim of the boat, also this was the best way to have all four batteries as low as possible in the boat. I played with cardboard mock-ups of the batteries before deciding the final position. I strongly recommend working with mock-ups, these guys are much heavier that it seems! Performance? We couldn’t be happier. When motoring I feel our personal “sweet” spot is around 4 knots, and that’s easily feasible with the new motor, it gets up to 7 knots easily, but then the battery drainage skyrockets. This morning we have been out for a couple of hours and the batteries barely discharged, when we came back they were at 96%. Again, we are never in a hurry… Also, I concur with Miles assessment in relation to the price for the batteries, Mike’s price was significantly lower than the one advertised by West Marine; the same for the battery charger. The most unexpected advantage? We are really bad sailors and terrible when it comes getting in and out of the marina, with full torque at low speed and the ability to switch gears in no-time, docking just became a no brainer. That, the lack of noise and the lack of smell have changed completely the experience of these naïve sailors. It may not be that important for people more experienced, but for us it has been. If only one additional recommendation, I think I would do the change out of the water, it gives you the opportunity to look at everything and not suffer when you mess with the transmission and shaft.